Yes, I’ve got Valentine’s Day on my mind…seems to be what I’m having fun creating these days! 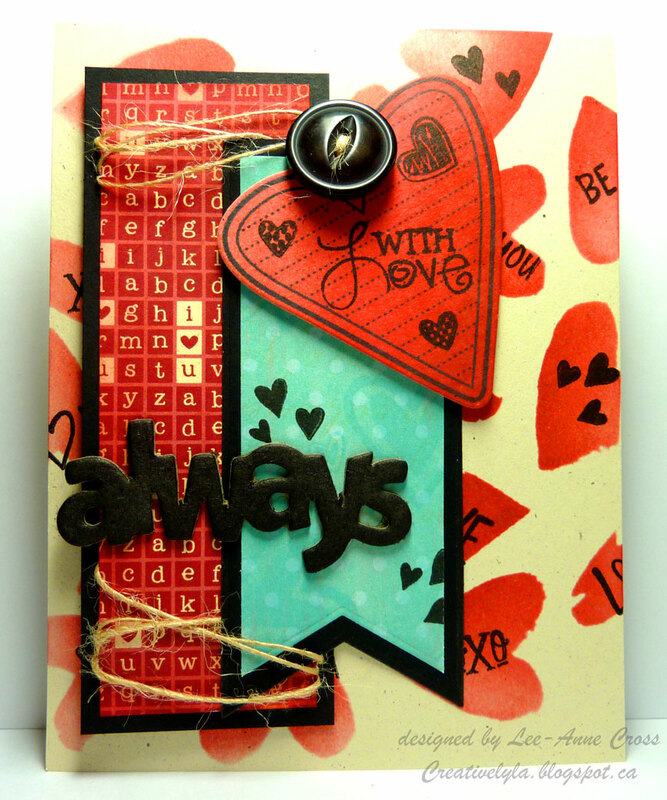 This card is for the Sketch Challenge over at Splitcoast Stampers today. The card starts with an ivory colored base. I’ve used a template to sponge on the red hearts in various shades of Distress Inks. Then each little heart has been over stamped in black with images from Verve’s Love Notes and No Matter What. Next I added a large rectangle of designer paper that’s been sponged with more red Distress Ink and matted with black card stock. The aqua colored banner is also from designer paper but it was inked with more Distress Ink and then over stamped with the aqua hearts and little black hearts from No Matter What. I sponged the same red inks on a piece of the card base paper, stamped the lined heart, die cut it and added a few more hearts for emphasis. Added some twine around the two pieces of designer paper, popped up the large heart on dimensionals and added a button with more twine. And finally, a piece of chipboard that’s been inked with Distress Ink. This is just fabulous! Love the way you stamped little sentiments in each of the background hearts. Beautiful card! What a beautiful Valentine's Day card!